Chicago Doorways is your source for quality commercial doors, frames and hardware in the Chicago metropolitan area and surrounding suburbs. We work closely with customers to make sure they get the specialized care and exact products they need to successfully complete their projects. Commitment to Customer Service – Chicago Doorways was established in 2000 with the belief that every construction project requires focused attention. We handle every order with attention to detail and in a professional manner. Experience and Expertise – Chicago Doorways has years of experience working with doors, frames and hardware. Our professional team includes certified Architectural Hardware Consultants (AHC), Fire Door Assembly Inspectors (FDAI), project managers, estimators and skilled shop and installation technicians. We pride ourselves on providing accurate bids, sharing our extensive product knowledge and delivering orders as promised. 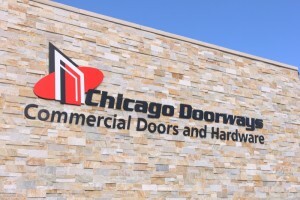 Strong Partnerships with Manufacturers – Chicago Doorways has great working relationships with all the major door and hardware manufacturers so you get the products you need in a timely fashion. Close to Your Worksite – Chicago Doorways is centrally located in west suburban Elmhurst. Big or small, complex or simple, trust Chicago Doorways to help make your project a success. Chicago Doorways’ mission is to be the trusted business partner and full-service supplier of quality commercial doors, frames and hardware for our clients.